Now take your Castles & Crusades character wherever you want on your iPad! 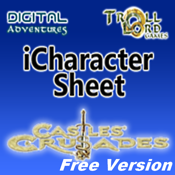 This app download is the FREE version of the iCharacters Sheet - Castles & Crusades product. Certain functions are disabled in this version so buyers can get a "feel" for our application prior to purchase. Characters cannot be save or exported in this FREE version. * Pop-up equipment, spells, and magic item entries to give you more entry information. * (FULL VERSION ONLY) Export your iCharacter Sheet to an HTML file that you can email to yourself or your Castle Keepter. Future upgrades to this app are in the works to further broaden functionality and add additional tools for the C&C player. If you like this app please buy our FULL version iCharacter Sheet - Castles & Crusades! It is important to note that the iCharacter Sheet - Castles & Crusades is not a character generator, and contains no coded or database driven C&C rules or game information. The iCharacter Sheet - Castles & Crusades is an input-only tool, per legal usage as outlined by Troll Lord Games. The iCharacter Sheet brand and iCharacter Sheet - Castles & Crusades application product are trademarks of Digital Adventures, LLC and Troll Lord Games, ©2011, ALL RIGHTS RESERVED. This product’s format, programming code, and presentation is copyrighted by Digital Adventures, LLC and its partners and licensors. Purchase of this product subjects the buyer to the Apple App Store legal Terms of Conditions regarding purchase and use.